Les Kaye and Teresa Bouza will offer the Saturday morning Dharma talk at 10:15 am in the City Center Buddha Hall, followed by Q&A and a book signing in the dining room. 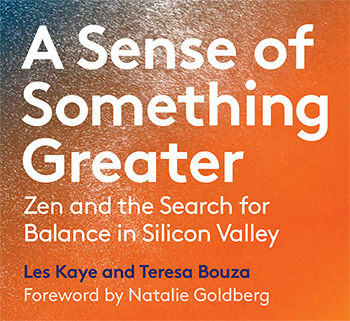 A Sense of Something Greater: Zen and the Search for Balance in Silicon Valley goes deeper than the current mindfulness trend, into the heart of Zen practice. 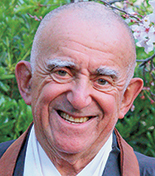 For Les Kaye, Zen is more than awareness––it’s also “the continued determination to be authentic in relationships, to create meaningful, intimate, intentional bonds with people, things, and the environment.” Kaye’s teachings are paired with interviews with current tech employees and Zen practitioners, conducted by journalist Teresa Bouza. A Sense of Something Greater is an essential book for business leaders, mindfulness meditators, and Zen practitioners alike. Les Kaye has been integrally involved in developing Zen practice in America for over fifty years. He started work in 1958 for IBM in San Jose, California, and for over thirty years held positions in engineering, sales, and management. Les became interested in Zen in the mid 1960’s and started Zen practice in 1966 with a small group in the garage of a private home. In 1970, he took a leave of absence to attend a three-month practice period at Tassajara Zen Monastery in California. The following year he was ordained a Zen monk by Zen Master Shunryu Suzuki, author of Zen Mind, Beginners Mind. In 1973, he took an additional leave of absence to attend a second practice period, this time as head monk. In 1974, Les received Dharma Transmission, authority to teach, from Hoitsu Suzuki, son and successor to Shunryu Suzuki. In 1985, he was appointed teacher at Kannon Do Zen Center in Mountain View, California. He and his wife Mary have two adult children and live in Los Altos. His first book, Zen at Work, includes stories of how his own meditation practice enhanced the quality of his life and work. He is also the author of Joyously Through the Days: Living the Journey of Spiritual Practice. Teresa Bouza is a journalist with extensive experience in Europe and the United States, most recently covering technology and innovation in Silicon Valley. She has worked for The Wall Street Journal as well as Spain’s global news agency EFE and the Spanish business daily Cinco Dias. She is the founder of Datafest, a computing contest to develop technological solutions to challenges like international migration and life in modern cities. She has led several international and collaborative events. She has worked with engineers, developers and data experts across the globe, both at universities and in various industries, while organizing the hackathons. 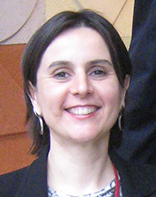 Bouza has a master’s degree from Columbia University and was a Knight Fellow at Stanford in 2012.